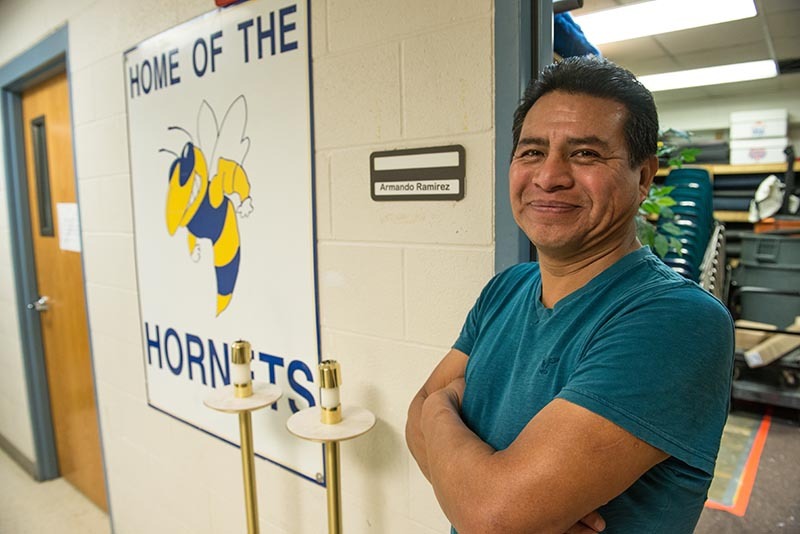 Being a friend to all is not in his job description, but it is one of the important roles Armando Ramirez fulfills at Holy Cross School in Overland Park. Administrators and teachers say he is a positive, friendly presence to everyone he meets. OVERLAND PARK — Possibly the most popular person at Holy Cross School here is Armando Ramirez. Ramirez isn’t a student, a teacher or an administrator. He’s the custodian — a key player in not only making the school pleasant and functional, but also in fostering its esprit de corps. Principal Allison Carney praised Ramirez for his devotion, skills, work ethic and cheerful demeanor. “He’s the multitask man,” said Carney. Ramirez cleans and waxes the floors, shovels snow, assembles and fixes furniture, does basic plumbing and electrical repair, sets up and breaks down seating and tables for games and twice-weekly Masses, fills potholes, cleans bathrooms, cleans classrooms, changes light fixtures — the list could go on and on. “Above and beyond” includes helping serve and clean up after lunch, coming in on weekends to make the gym ready after a game, and occasionally serving as translator to aid parents who can only speak Spanish. Ramirez’s hours are 7 or 7:30 a.m. until “finished” p.m., Monday through Friday, and some weekends as necessary. His wife Araceli, who cleans Holy Cross Church, helps him in the afternoons and evenings. Occasionally, he’s helped by one of his three sons, Overland. Now an eighth-grader at Holy Cross, Overland was named for Overland Park — out of his parents’ love for their new city and new country. It wasn’t easy getting here. Ramirez was born and raised in the town of Santa María del Río in the Mexican state of San Luis Potosi. After high school graduation in 1986, he came north to find work. He worked both in Texas and Minnesota. On a regular trip back to Mexico, he passed through the Kansas City area. He liked it: The people were friendly, and there were so many big trees! During one trip, he met his future wife, and they later married. Getting her the right documents to enter and stay in the United States would take years, but he was patient. But then, the 9/11 terrorist attacks extended the process. In the end, it took 18 years to get Araceli and their three sons to Kansas. During that time, it was difficult for him to be away from his family, he said, especially during birthdays and when one of the boys was sick. Before the family was reunited, he was hired part time in 2004 by Holy Cross School. He became a parishioner, and the parish helped him navigate the immigration process. Finally, his family arrived in 2013. Ramirez became the chief custodian (the only custodian, really) by last August. He does things with a smile and a happy demeanor. It rubs off. Susan Gittinger, a fourth-grade teacher at Holy Cross, said Ramirez had a big impact on her family. When her daughters were Holy Cross students, they “adopted” Ramirez, and Ramirez adopted them. Today, her daughters are grown. One works for the Central American Resource Center in Washington, D.C., and another is a program director for Amigos de las Américas in Houston. The third is a teacher at Our Lady of Unity School in Kansas City, Kansas. One of the great things about a Catholic school is how every adult in the building plays a role in forming the children’s faith.